The most exciting element of cricket is to watch a good fast bowler charging in and hurling a few missiles that peg the batsman onto the back foot or send the stumps cartwheeling. 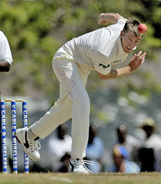 This the bowler can do on a consistent basis only if he has strong, powerful and 'fit' shoulders. The shoulders have to be complemented with the proper technique, and that is exactly what I will be explaining in this article. The process of fast bowling starts from the bowling mark. The run-up has to be right. A correct run-up gives the bowler the momentum to gain power by the time he reaches the crease, and to bowl quicker. Fast bowling puts a lot of strain on the shoulder muscles, but the chances of straining them or getting injured can be reduced to the minimum if the run-up is smooth and proper. The run-up has to be smooth and steady, with smaller steps. The bowler should get into his delivery stride gradually as he nears the crease. His arms, legs and every other part of the body should move forward. We all know that the best way to bowl is either side-on or with open-chested. There is no question of having an action that is a mix of the two approaches, as it will maximize the chances of an injury. There are several ways in which a bowler can judge his action and detect faults if any. One of the best methods is video-recording, as it enables the bowler to view himself in slow-motion and thus makes it easy for him to examine each and every movement of his. The better the technology, the better are the results. But, the value of any method depends upon the experience of the person who is evaluating the picture along with the bowler. The feedback of the coach, biomechanist or a sports physiotherapist, all of whom ideally ought to have a lot of sports-related work experience, is one of the most important factors that can contribute to the success of a correctional method. A bowler should try and avoid using a mirror. This is rarely effective, as the bowler then starts concentrating on the position of his shoulders while looking at himself, and this can reduce his focus. After all, they are supposed to concentrate on the batsman and the stumps at the other end. Poor performance and shoulder pain have their origins in faulty technique. They often occur when muscle fatigue sets in. However, a good coach or physio will be able to sense when something like this is happening, and realize that it is time for rest and recovery. 1.An open-chested bowler trying to bowl faster by using his shoulder muscles excessively with insufficient trunk-twisting. 2.a An open-chested fast bowler trying to hit the seam harder & harder with the high arm action. 3. A bowler with a side-on action trying to take his elbow behind his shoulder during his follow-through. The closer the line of the upper arm is to the line of the front of the chest, the lesser is the strain that is placed on the shoulder. I hope this helps the reader to understand why a fast bowler measures his run up, and why a paceman sometimes stops in the middle of his run-up when he realizes that he has lost his rhythm. Yes, it is the run-up that gives him the rhythm to bowl faster, and reduces 60-70% of the strain that is placed on his shoulder. 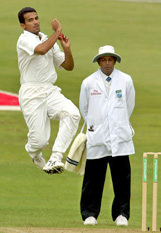 A fast bowler should have a proper follow-through and finish after releasing the ball to minimize the chances of straining the shoulder in the last stage of the bowling action. While bowling an inswinger, a bowler should ideally take his bowling arm and hand towards the inner side of the front knee . If the hand moves towards the outer side of the knee, it means that the shoulder is moving in an opposite direction (internal rotation). This puts a lot of strain on the rotator cuff muscles, which ultimately leads to a shoulder injury. Similarly, a bowler delivering an outswinger should take his arm and hand towards the outer side of his front knee. The chances of a rotator-cuff injury are high if the arm goes towards the inner side.